The adult LEGO builder is often left to their own devices to find books to help them learn building techniques. There are a few resources online, but having a building guidebook at one’s fingertips is something that has been wished by many a builder. No Starch Press has been a publisher that, while publishing unofficial LEGO-themed books, has made many books for experienced builders.The LEGO Architecture Idea Book is a good example of what any architectural builder would want. Alice Finch with one of her models – Hogwarts Castle. 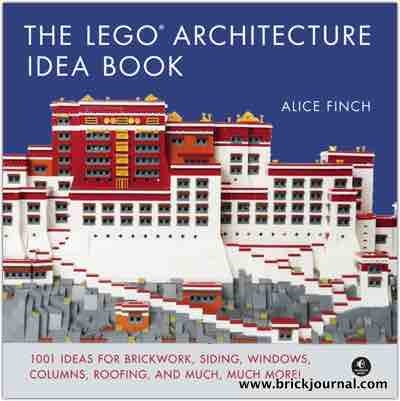 Written by Alice Finch, one of a group of leading LEGO architectural builders, The LEGO Architecture Idea Book is an index of building techniques that are meant for building…well, building and structures. There are 16(!) sections on building architectural elements, from windows (four types of windows) to columns. The sections are extensive, showing how to build different versions of a given element in each segment. Examples are broken down or diagrammed by brightly colored models (How Tos) to show how to build – there are no instructions. Here’s a spread on building doors. The photos and diagrams are more than helpful in showing building methods, but what is lacking is a basic look at a building to use all of these details…there is an assumption that the reader knows what they are building. The book’s focus is on the exterior details of any building – which, for the most part, is what is seen the most at any display. Interior details and furniture are not shown in this book. The best sections are on making round items, such as towers and curved walls, and stained glass treatments, as they provide an array of different approaches to making dazzling additions (especially in stained glass) to a building. Making curves is also important in building, as LEGO is very slanted toward building straight angular models as opposed to curved and rounded models. This book is a great addition to a LEGO building library and is perfect for a person who who likes to build traditional buildings – the elements shown in the book would be good for castles, cathedrals, and other older structures. Modern buildings will have less to use (smoother walls, basically), but will be able to use patterned tiles, fences, panel windows and molding as detailing. However, this book is meant to add details, not build a basic structure – the builder will have to have a framework set up for their building and add these items. That’s not a bad thing – for this book, adding such information would make it a bit thicker. Another nice thing is that architectural terms used to define details, such as pediments and pilasters for windows. I really like how I can track down a building technique relatively quickly, thanks to the sections and the corner graphics/icons on each page. The page layouts are somewhat reminiscent of Yoshihito Isogawa’s idea books, which are also published by No Starch Press. As a reference, it’s a book I see becoming a standard for architectural builders as a nice index to detailing.